The game 20,000 Light Years Into Space is a real time strategy building simulation with a steampunk theme. The basic idea of the game is we are in charge of setting up a colony on a new planet and our colony needs steam. Our job is to create production plants which harvest steam from vents in the planet’s crust and to run pipelines from the vents to our colony. Periodically we expand our colony, growing it into a city and, as the city grows, the amount of steam we must gather increases. 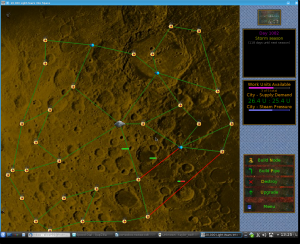 20,000 Light Years Into Space (2kLYIS) combines real time strategy with something akin to SimCity style planning. 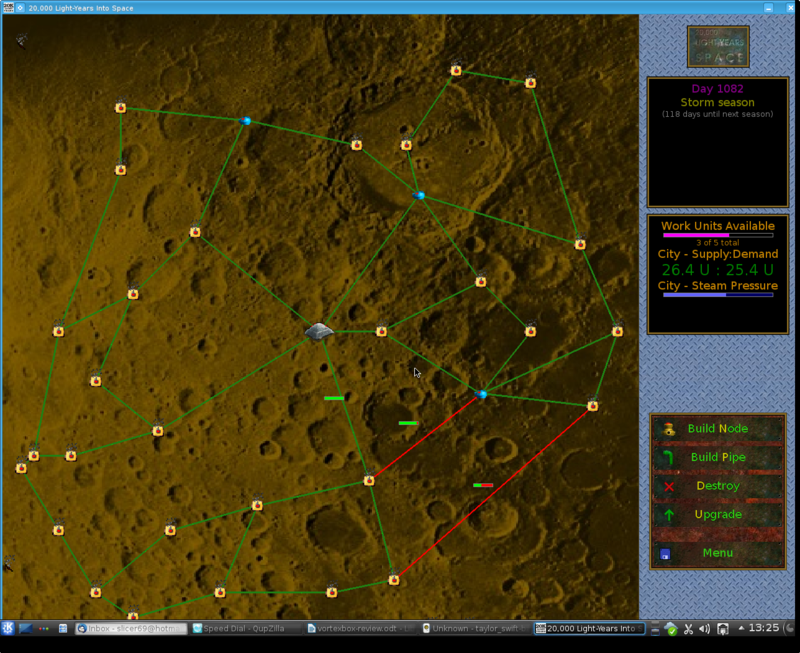 The simple, functional graphics and game play bring to mind a computerized board game. There are relatively few controls — we can build nodes or pipes and we can upgrade or destroy items we have previously created. The challenge to the game is that the environment is hostile. While we are attempting to build our infrastructure we must weather alien attacks, destructive earthquakes and atmospheric storms. These events strike seemingly at random and knock out existing pipelines and steam-gathering nodes. One of the first things I noticed about the game (and loved, by the way) is that it features a tutorial. The tutorial explains the symbols on our top-down map of the world and walks us through the process of creating production nodes and pipes. The basic concepts of getting steam from the vents to our colony are covered, along with some very basic strategy for protecting our nodes from attacks. This went well and I felt the tutorial did a good job. Once the tutorial was completed I found regular game scenarios come in, basically, two flavours. We can play a game where we are just given a sandbox where we can build infrastructure and experiment without any hostile aliens or weather systems. Alternatively, we can play games in hostile environments with varying degrees of difficulty. The object of the game is to grow our colony (and its steam infrastructure) to a certain point. One thing I quickly learned was that one should not try to upgrade a stream production centre if it is the only production centre. Upgrading a pipe or a node takes it off-line and, if it is the only production node, this immediately loses the game. (My shortest game lasted approximately fifteen seconds.) Something else I soon learned was to ignore the dots indicating flow between nodes. Little green dots flow along the pipes between nodes and I soon found that dots always moved from areas where nodes had been upgraded to nodes without upgrades. This can make it appear as though steam is moving away from the colony toward newly created production centres, rather than the other way around. However, the flow of the green dots does not appear to correspond with the actual flow of steam/fuel. At first I played a couple of practice games without any hostiles and found it was easy to create production centres, run pipe and upgrade the colony. So long as I had enough nodes my production easily kept up with upgrades to the city. However, when I started playing in hostile environments I ran into trouble, though I often was not sure why. The first time through I almost made it to my final objective, but the game suddenly stopped and announced I had run out of steam. I had lots of functioning nodes, so I wasn’t sure where I had gone wrong. I went back and played a practice game, focusing on keeping my steam reserves high. Figuring I’d got the hang of infrastructure management I tried again in hostile mode. This time I made it about halfway through when suddenly my steam supply dropped off and the game, again, ended. This time I felt I knew why, I was expanding and growing too quickly. In my next two games I focused on building slowly, making sure all my production nodes and pipes were upgraded before upgrading my city. In both games, with a full network of upgraded production centres, my game was brought to an end when a single production well was knocked off-line in an alien attack. Ultimately, what I found, through experiments in the sandbox and in the hostile environments, was that the game begins with one working production node. If that node goes off-line, even briefly, the game typically ends, no matter how many other production centres are on-line. I suspect this is a bug in the game, but I’m not entirely sure, there may be other factors at work. What I took away from my time with 2kLYIS was that it is an interesting concept, the combination of building and the randomly destructive environment makes for a fun, yet challenging scenario. It is difficult to balance one’s game, maintaining the existing production against enemies while expanding. The game is simple in its design, but can get complex in its execution and I like that. What frustrated me was that I found, as the infrastructure grows, we need to spend more and more time maintaining it rather than growing our pipelines or city. Eventually, as the map fills, we end up spending almost all our time fixing pipelines as storms and earthquakes wreck our work. One gets the impression of taking two steps back for every click forward and I found this “rapidly treading water” aspect in the later parts of the game felt more like work than entertainment. In short, I feel 2kLYIS is a good concept, it is stable, takes very few pieces and makes something fun and challenging from those simple parts. I do think there are either some bugs to be ironed out or I’m missing something vital in the mechanics of the game. Either way, 2kLYIS is easy to learn and tough to master. Worth giving a try, especially if you like building simulations and SimCity style games.